Wohlsen Construction received two Excellence in Construction Awards from the Eastern PA Chapter of Associated Builders and Contractors (ABC) at the association’s 28th Annual Excellence in Construction Awards Gala. An Award of Excellence was presented to Wohlsen for the work at Williamson College of the Trades in Media, PA. 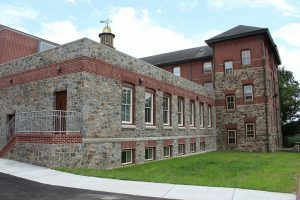 Designed by Blackney Hayes Architects, this project included renovations and additions to the campus’s community hub – Rowan Hall. This historic building was originally constructed in the 1880s and was designed by famous architect Frank Furness. Wohlsen’s team worked diligently to ensure the project blended seamlessly into the 130-year-old building while ensuring work was conducted safely and with minimum impact to the surrounding operations of the campus. Additionally, an Award of Merit was presented for Eastern University’s McInnis Hall Nursing Resource and Simulation Lab. 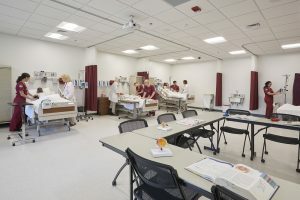 Designed by Derck & Edson Associates, the team transformed former faculty offices into a state-of-the-art learning and training center with two nursing labs, two high-fidelity simulation labs, and a control room. The project was completed five weeks ahead of schedule, taking special care to minimize disruption to the occupied classrooms surrounding the suite.